The Golden Temple — also known as ‘The Abode of God,’ Sri Darbar Sahib and Sri Harmandir Sahib — is one of the holiest sites in the world for followers of Sikhism. Floating at the end of a long causeway, the Golden Temple itself is a mesmerising blend of Hindu and Islamic architectural styles, with an elegant marble lower level adorned with flower and animal motifs in pietra dura work (as seen on the Taj Mahal). Above this rises a shimmering second level, encased in intricately engraved gold panels, and topped by a dome gilded with 750kg of gold. In the gleaming inner sanctum (photography prohibited), priests and musicians keep up a continuous chant from the Guru Granth Sahib (the Sikh holy book), adding to the already intense atmosphere. After paying their respects, pilgrims retreat to the intricately painted gallery on the second level to contemplate. 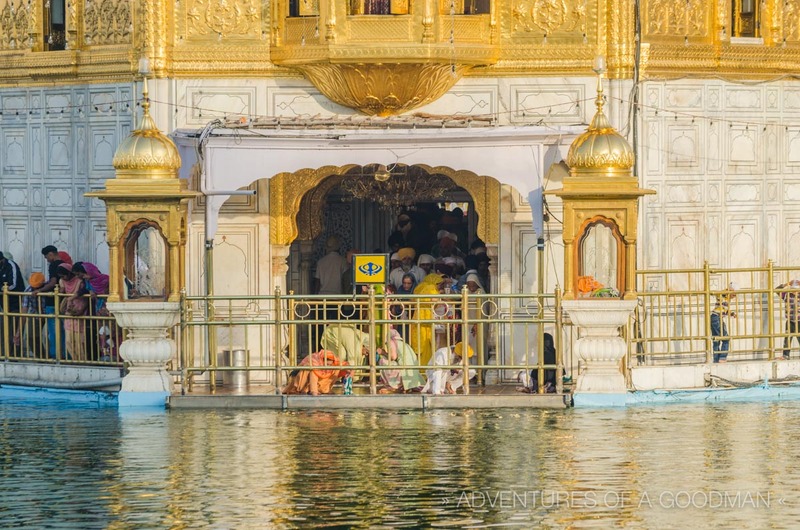 The pool that surrounds the Golden Temple is known locally as the Amrit Sarovar, which literally translates to ‘the Tank of Nectar of Immortality.” Devotees believe that the water, which originates from the Ravi River, contains healing powers. 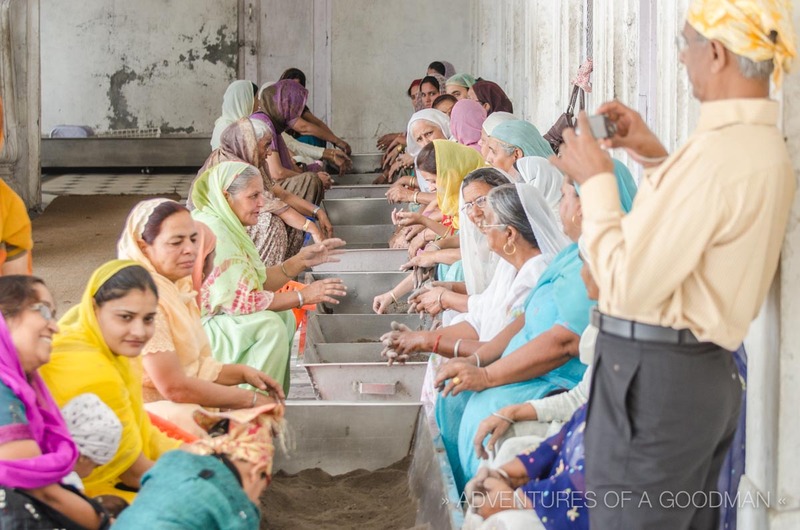 As such, many Sikh people travel from around the world on a pilgrimage to bathe in the Amrit Sarovar holy pool. While the Taj Mahal may be India’s most famous monument, Amritsar’s Golden Temple is equally as beautiful … though harder to reach. Unlike many parts of India, Amritsar has a very distinct winter. In fact, the first time my wife and I visited India, it was too cold to visit the Golden Temple. Located deep in the Punjab region of India and alongside the Pakistan border, getting there can be a bit of an adventure as well. 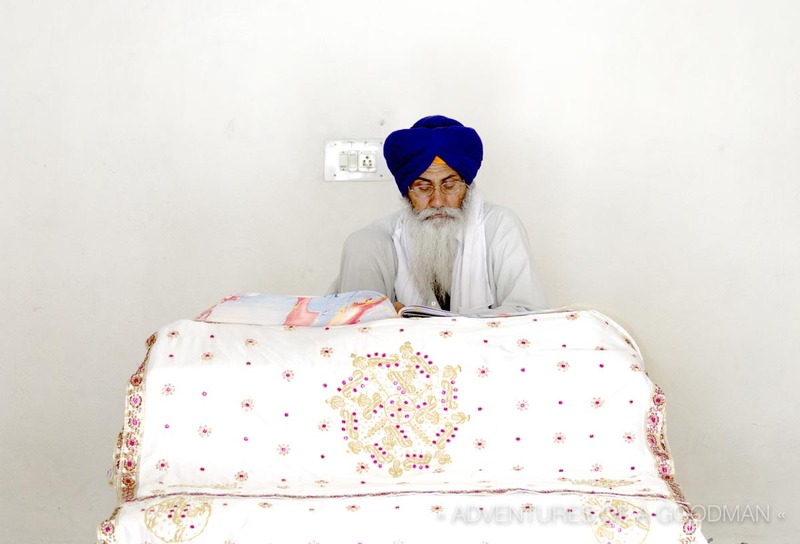 Unlike a visit to Rajisthan or Goa, there’s little else around Amritsar. All that said, visiting the Golden Temple is well worth the time and effort it takes to get there. The temple complex is an amazing place to spend a few days, and there are plenty of other sights to see in and near the city of Amritsar. Upon arriving at the Golden Temple, be sure to find a safe place to store your shoes … they’re not allowed inside the complex. For a few rupees, you can store them at a designated area where they will be watched by a guard. Or, if you’re the trusting type, you can simply leave on the ground alongside the massive collection of other people’s shoes. How do I know this? Because I tried to enter the Golden Temple with shoes on and was promptly scolded by a large and angry Sikh security guard. Finally, with your shoes safely stowed, all that’s left to do is wash your feet in a dirty stream of running water and enter the complex. What’s it Like Inside the Sri Harmandir Sahib? Surrounding the the Golden Temple and Pool of Nectara is a covered marble walkway (parkarma) and a huge building complex. Throughout the day, families and devotees congregate on the parkarma … relaxing, eating, rehydrating, praying and sleeping in the shade. Most doors into the buildings are open, and filled with museums, temples, memorials, shrines and places for gurus to sit, read scripture and spend the day chanting in Gurmukhi. The complex also houses the Akal Takht (throne of the timeless one). This holy shrine serves as the seat of God’s authority for administering justice and considering temporal issues. That said, it’s even more beautiful than you can imagine. 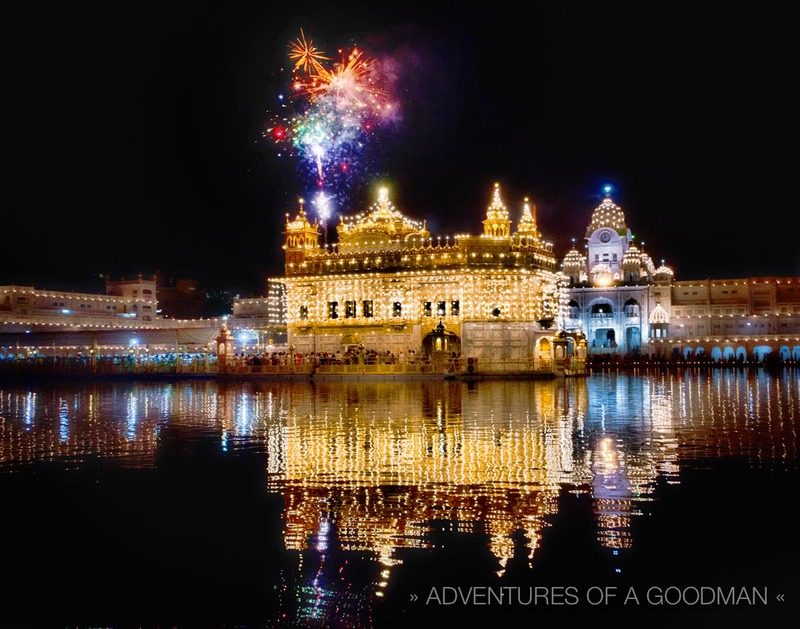 During my first day at the Golden Temple, I returned to Sri Harmandir Sahib just after sunset and found the entire Golden Temple complex covered in lights and surrounded by candles. Thousands of pilgrims stood still, chanting and praying. It was a very moving scene, although the photographer in me just wanted to be taking photos. Carrie, Lauren and I sat there for quite a while, taking it all in. Then, just before we stood up to leave, a fireworks display began just over the Golden Temple. Apparently, it was Guru #9’s birthday, and this was the celebration. Inside the Golden Temple, walls are painted with delicate marble and gold-laden artwork depicting religious stories. In the center, several holy men sit reading scripture and leading chants that are broadcast throughout the Golden Temple complex on loudspeakers. Golden Temple visitors either can take a pre-determined path through the temple or sit down and pray or meditate along with the other pilgrims. We did both, gazing in awe at the intricate carvings and artwork while stopping to meditate and listen to prayers. At one point, Carrie and I joined the masses and sat for an especially-holy prayer. I found myself having a tough time being “forced” into sitting for religion. Carrie, on the other hand, didn’t have that problem and sat there enjoying the beauty of the melody and the power of so many people chanting in unison. The next day, we awoke at the crack of dawn, headed down to the Golden Temple and were treated to a majestic sunrise of oranges, pinks, purples and blues. I could have sat by the Amrit Sarovar holy pool for hours, but the line for the actual Golden Temple was short and we had a train to catch. 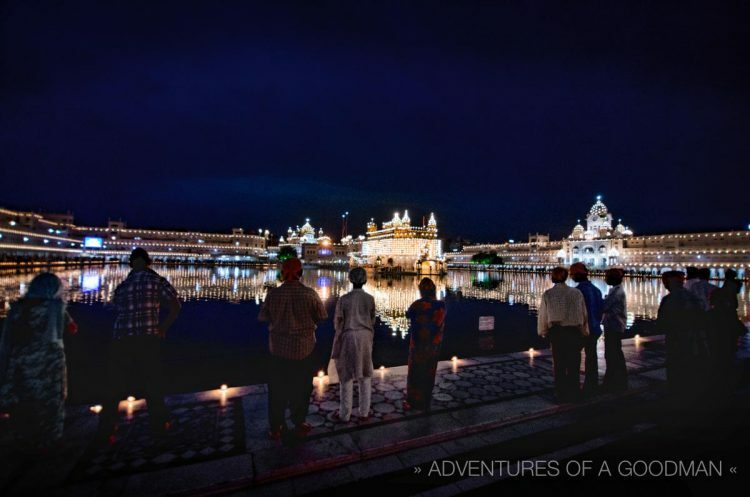 Want more stories from the Golden Temple?